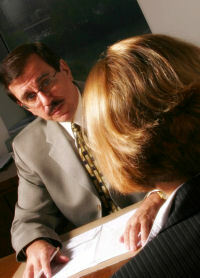 Marriage Counseling - when should you get help. Though counseling is well known and proved to help people with their issues, many still hesitate to receive expert advice from counselors. Are you in need of expert advice? The following information will help you understand what counseling is and how it can help you, plus explain when you should get a counselor's point of view and advice on your issues. A counselor is someone (usually with a major in psychology) who specializes and is qualified to help others better understand their issues and assist them in finding the best solutions to their problems. Most people feel offended when counseling is suggested because they feel that they are being portrayed as a "crazy" person. Seeking expert advice and input on the events that take place in your life does not define you as crazy or less knowledgeable than anyone else. In fact, accepting that you are experiencing a difficult situation in your life defines you as more knowledgeable, because you care enough about yourself and your issues to find successful solutions. Too many people mistake counselors with psychics or miracle workers. The truth is, no one knows what is really going to happen in your future beforehand, nor can anyone make things 100% better for you. You hold that power. Counselors are dedicated to giving you good guidance and advice on how to make your troubling issues better, so that you can live happier and get what you need and deserve from the things and the people in your life. A counselor will also assist you in becoming a better friend to yourself, teaching you self-help methods that will help you love yourself more so that you can achieve your dreams and goals. Keep in mind that there is no need to feel embarrassed or afraid to talk about anything with your counselor. Counselors do not and will not judge you. Their only desire is to get all the information that is necessary from you, so that they can help you in everyway they can. There are many cases where someone wants professional help, but does not know when it is the right time to get it. The right time to receive expert assistance is when you feel you cannot solve your problems on your own even though you have tried on numerous occasions, or whenever you feel the need and desire for professional input. You know when the right time is, so when you get that feeling, be sure to act on it right away before you give your insecurities and/or doubts about counseling time to come to surface, which will most likely cause you to back off and change your mind. If you do start to get doubts, just fight it by keeping in mind of why you considered expert help in the first place. By ignoring your own cries for attention and assistance, will only make your issue worse over time and leave you more frustrated than you were to begin with. So listen to yourself and trust yourself.